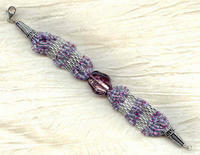 I've added a wealth of lavender and fuchsia mixed seed beads yoked into a band by larger silvery beads. The band is further tamed by intricately wrought sterling silver cones. 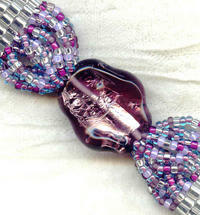 The bracelet measures a smidgen more than 8", and closes with a sterling silver lobster claw. This completely captivating bracelet is brought to you by SPARKLE PLENTY, of course. Here's a set made with Swarovski Crystal's 'metro' pendants: sparingly faceted corner-drilled squares. Here's a necklace that's a paean to purple.